Product Details:• These furnaces are for forging for high temperature application up to 1400 deg C. Could be also used for other heat-treatment activities. • These furnaces are built very tough. The furnace hearth is lined with heavy-duty fire bricks to with stand the rigorous of a forging operation. • Detailed instruction manual is provided with every furnace to help the operator understand the operation of the furnace in detail. • The furnaces are competitively priced. Demak Exports is into the Manufacture and Export of Capital Equipments like Industrial Heat Treatment Furnaces, Ceramic Kilns and Industrial Ovens. We have an existing set up to manufacture these equipments. Heat Treatment Furnaces: These equipments are used for applications like hardening, annealing, tempering, stress relieving, forging etc. 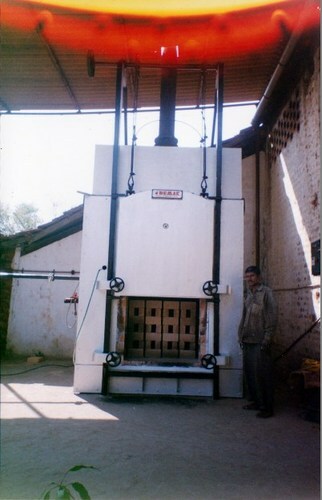 Ceramic Kilns: These equipments are used for applications like Biscuiting, Ceramic Glazing, Ceramic Sintering etc. in various industries like pottery, ceramic items, water filter candles etc. Industrial Ovens: These equipments are used for applications like sintering, drying, solder baking, pre-heating etc. Our heat-treatment furnaces and Industrial Ovens find application in various industries like automobiles, heavy engineering, cutting tools, hand tools, forge shops, foundries, motor/transformer manufacturing, ceramic/pottery, bakery etc to name a few. Our team of competent professionals ensures prompt response to customer enquiries followed by very competitive offers, timely supply of goods, regular follow ups with clients and quick redressal of customer grievances, if any. Our equipments are built tough to last long, and hence, most of our clients are repeat clients, who have been patronising our products for a very long time.